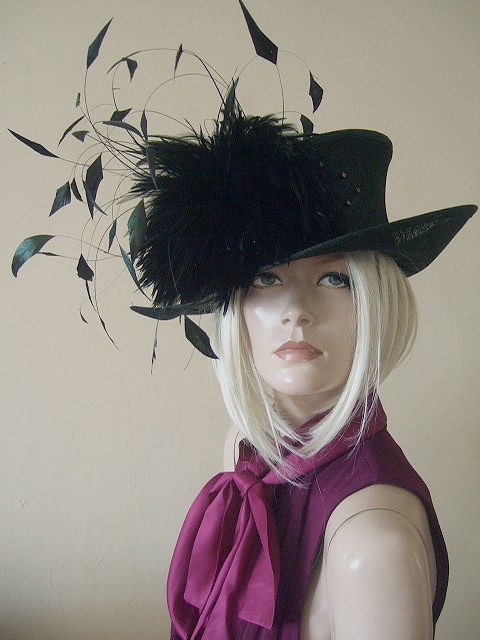 Very striking Small Brim hat, Hand Made by leading Yorkshire milliner Dyonni. This hat has a small size brim "Champ Elysee" style with a large Coque and Goose Hackle arrangement at front, and Platinum coloured cubed metal beads on one side and a tie knot twist in the crown wrap the other side. With it's small brim, but lot of pretty detail, it is a very popular choice for petite frames..
Brim is 2.5-3.5" wide (wider on the upturned side). Crown Height is 4-5" (shorter on the feathered side).